It is the end of September already and the countdown for holiday season is upon us. Company’s coming! Are you ready? Have you started looking for the newest trends for Fall 2017 to help inspire your ideas to create your happy haven that guests will swoon over? Perfect! You found the right place. Interiors are similar to fashion, there is always something trending. When a trend is introduced into interiors, it differs from fashion because it will stick around a lot long --- like years up to decades! Staying up to date can be a challenge. Taking the time to scour Pinterest for ins and outs is so time consuming. So, I did it for you! Gathering a list of how the interior decor is changing for the season is my gift to the busy moms, dads and families out there that still want to have a home that is them! A reflection of their personalities as well as current and fresh. Check out the list below how you can refresh your home for the fall season into 2018! First and foremost, remember to choose what you love, regardless of what might be in style. 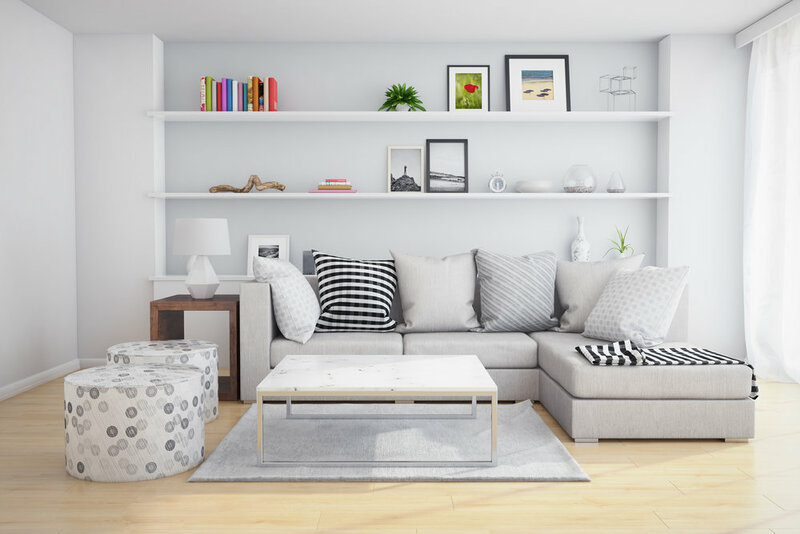 But as the weather shifts from summer to fall, it can be fun (and not to mention easy and cheap) to make a few changes to your house as well. Here are some of my predictions as we finish out the year! 1. Over the last few years, we saw a huge emphasis on white, white, white. Get ready, white is getting warmer! Adding color to your space and embracing the warm rich shades of brown, black, deep navy, green and blush will add whole new layer to your space. 2. Marble has been all over the place! When you go to Pinterest, you can see marble on floors, counters and walls. Moving into the fall and winter seasons, you will see less of an emphasis with the all over marble look, and more on the touches of marble to keep the simple, classic look. So, what direction should you be opting for instead? Opt for earthier material, such as wood, clay and metal worn finishes. This goes along with the color change of warm, cozy colors. 3. Do you love or loath copper finishes? You either have a love - hate relationship with the metal. The thing to remember with copper is to stick with the real deal. That will always have a classic feel in your home, but know, the fake, bright copper accents everywhere will fade away. As, you shop around for your home over the next two seasons, you will notice classic aged brass is moving in over its counterpart copper. Brass is the new copper! It will be especially chic when incorporated into furniture in an overt way. 4. Want to feel a bit retro? Excellent…. The trend from the 80’s-90’s is BACK! That’s dark green baby! As stated above with dark colors coming into a space, this color will be a perfect hue to set the earthy tone. Have fun incorporating this color into your home. Need help and inspiration? The options are endless. Use the green as a statement wall, on upholstery (such as your sofa), dressers, inside bookcases, as well as decor and accessories. Your imagination is your playground….have fun! 5. Earlier this year I wrote about the philosophy of Hgyee. This concept will still resonate into the fall and winter seasons. Tech Free Relaxing Spaces will be the sugar addiction of the season. Meaning, we are all looking to turn off, shut down and unwind from the crazy overload of information and ongoings each day. Surrounding yourself in a space that is calming, serene and relaxing will help us to reboot. Pull up a comfy chair into a corner and create that reading nook to read, meditate and just unwind. Moving forward, there are other trends that will steal the scene this fall and winter seasons. But, today, there is a lot of information for your to soak up. Check back to get part two of the newest trends for Fall 2017 into 2018! You will walk away from these articles feeling like a rock star decorator that knows her stuff! Want help getting your space spruced up for the season? Let's Chat and see how I can help! Or, check out my fall favorite pieces here and purchase what you love!